Working on Super Bowl Sunday isn’t usually the best day for business, but as I pulled into the parking lot this morning I saw something that made me smile. 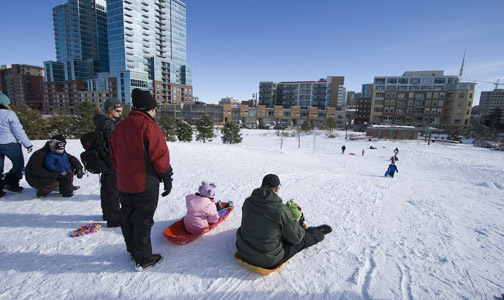 A ton of Denver and Riverfront Park residents were out enjoying the snow and sledding down the hill at Commons Park aka Commons Peak. There were all ages and a bunch of furry friends enjoying the the inches of snow we received last night. It really made me think about what a wonderful community we have here in Riverfront Park.